Minneapolis ECFE Parents Council: Join the MPS Early Childhood Education Council! Join the MPS Early Childhood Education Council! Starting this school-year, the Early Childhood Education (ECE) Council will be meeting immediately prior to the ECFE Parents Council Meetings on four dates: October 10, December 12, February 13, April 10. ECE is the umbrella organization under which ECFE, MPS Preschool (High Five, Alphabet Soup, and Three School), Teen Parenting, and Screening all sit. 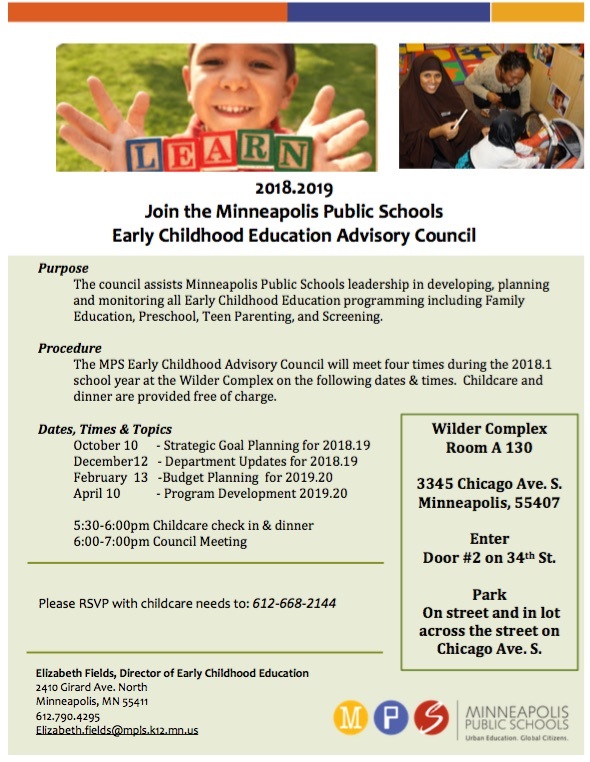 The ECE Council will assist Minneapolis Public Schools leadership in developing, planning and monitoring all Early Childhood Education programming. Please join us! Childcare check-in & Dinner will be from 5:30 - 6:00. The ECE Council Meeting will be from 6:00 - 7:00. See our meetings page for more logistical details.